Flight School’s competitive team is by invitation only. Girls that show commitment to the sport of gymnastics, the drive and a certain level of achievement can be invited onto the team. Our team competes in Region One Woman’s Artistic Gymnastics under the governing body of USA Gymnastics. Our team ranges from Level 2 through Elite. The Junior Olympics Optionals Levels gymnasts train between 16 and 25 hours a week. In these levels the girls have independent routines based on style and ability. When they arrive at this level, they have shown a level of commitment and talent at a high standard. They have the opportunity to compete at a local, regional, and national level. 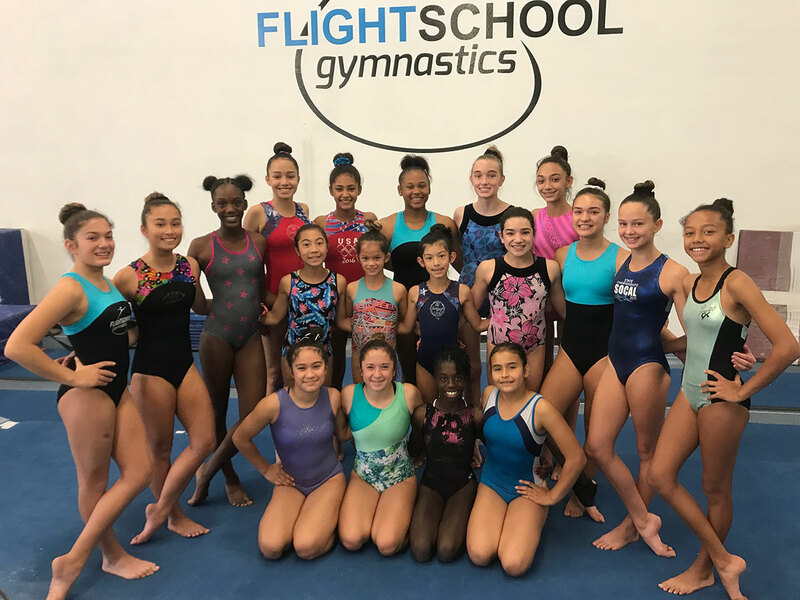 Through USA Gymnastics, the Elite program is designed for those athletes that show the skills, potential and drive to aspire to be part of the National team or Pre-Elite training squad for both Junior and Senior age groups. The Junior Olympics Compulsory Levels 3-5 train between 9 and 12 hours a week. They focus on building the fundamentals necessary to more advanced and difficult skills. In these levels the team will compete in local, sectional and state meets. This stage of gymnastics is the building block for the girls to achieve their skills to move into the Optionals Level of competition. This program is designed to offer a broad-based, affordable competitive experience outside the traditional Junior Olympics Program to attract and retain a diverse group of athletes. The Flight School XCEL team allows the ability to be a part of the team, but without the same costs and time constraints. 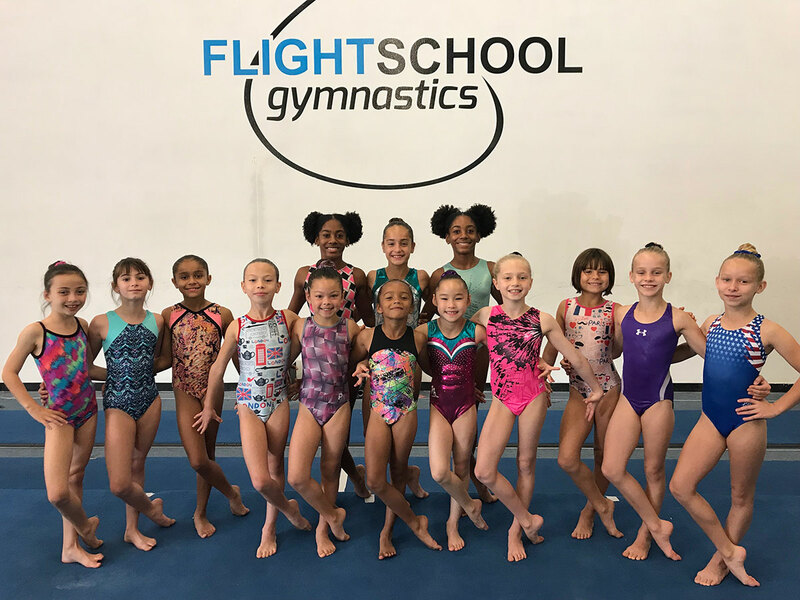 This program offers the gymnasts that may have other school or sports obligations to be a team member, compete, and succeed. The levels are: Bronze, Silver, Gold, Platinum, and Diamond, and each do have requirements to meet, but more flexible in which the gymnast will have to meet them. 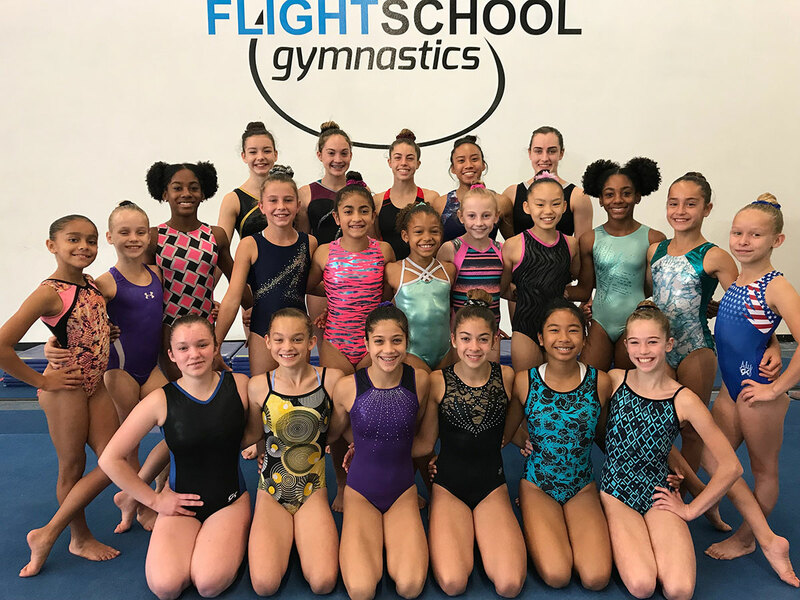 Floor, Bars, Vault, and Beam will each have a routine choreographed specifically to enhance and showcase each gymnasts’ unique abilities and talents and bring out the best in them. JETS is an advanced class that runs two to three times a week. This class is by invitation from your child’s coach. JETS is for girls ages 5 and up who show potential in flexibility, strength, behavior and skill level. Our goals remain the same: that your child associates fitness with fun and remains excited about fitness and gymnastics challenges. Your child will be encouraged to try new skills and activities, increasing self-confidence in the process. This class will focus even more on strength exercises and flexibility than the advanced preschool classes. This class is intended to prepare young gymnasts for competitive gymnastics.